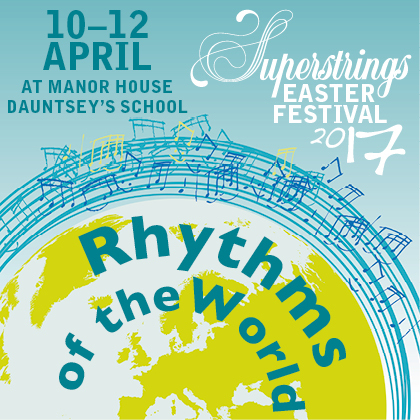 Superstrings are delighted to announce the launch of the Superstrings Easter Festival 2017. This year we will be exploring the vast range of musical tradition and culture from around our planet. We will be joined for a workshop by international percussionist, Sacha Johnson, who will put us through our paces - students and tutors alike! Students will also be studying some excerpts from our commission of Jeff Moore’s new piece which is being written for our summer course collaboration with the West of EnglandYouth Orchestra. Join Superstrings for a fun and creative three days playing great music, singing and creating beautiful artwork. Have fun with new friends and enjoy making music in the relaxed surroundings of Dauntsey’s Manor.